Chuck Norris Jokes in Style! He is the Superman of Superman’s and Chuck Norris has been at the top of the bravery stack. Enjoy the best of Chuck Norris Jokes here. Chuck Norris’s mother felt him doing an 18 hit combo. Who Can Clear The Dark? When Does Chuck Hear his Phone Ring? 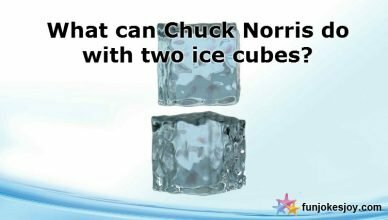 Two Ice Cubes Fighting with Chuck Norris!